>>View a photo album (2003). 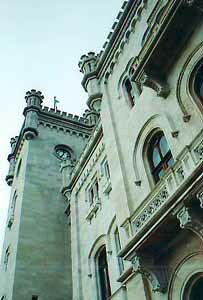 "Miramar" was the Archduke Maximilian von Habsburg's residence in the Italian seaport of Trieste, then a part of the Austrian Empire. It was here that Maximilian received the Mexican Delegation, a group of conservative Mexicans who offered him the throne of Mexico and thus began the tragedy of Mexico's Second Empire. >>Read an excerpt from chapter 2 of the novel The Last Prince of the Mexican Empire, a scene set in Miramar. The award-winning essay by C.M. 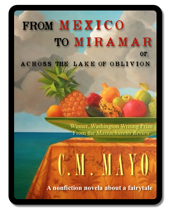 Mayo, "from Mexico to Miramar or, Across the Lake of Oblivion," now available in Kindle, iBook, and a 2-dics audio CD. Where to find C.M. Mayo's books and CDs?